The CBJ-MS Submachine Gun is best suited to close quarter gunfights since it has the lowest accuracy and range but highest fire rate of the Submachine Guns. This means you will need to choose attachments and perks to make the short range easier to handle. It is also vital you don’t expose yourself to long range and avoid the medium range. The CBJ-MS is a strong weapon in close quarters. The high fire rate means that hip fire is particularly powerful. If enemies are very close don’t aim down the sights but strafe and fire from the hip. At short to medium range it is worth aiming down the sights to ensure you get the kill faster. When you move around the map focus on the short range, but don’t be too afraid of the medium range. If you can catch an opponent off guard you can still win a gunfight at medium range. But if an opponent is ready retreat is the better option. Use the radar to estimate where enemies are and move towards them through close quarter areas. I found that I was running out of ammunition very quickly with the CBJ-Ms due to is high fire rate. Extended Mags will grant you more starting ammunition and 50% more bullets per magazine. Since you will have to be close to enemies most of the time and don’t want to alert other close by enemies use the silencer so you don’t appear on the radar. Select perks that will make the close range more effective or help you out in staying hidden. Ready Up will bring up your gun faster so you can sprint without worrying about being caught sprinting. Vitally Sleight of Hand will reduce reload times. Reloading will be frequent, even with Extended Mags, which can be deadly if you are close to enemies. Steady Aim makes hip fire more effective helping you in face to face engagements. Takedown will ensure that the death skull of an enemy you just killed won’t reveal your location to close by enemies. ICU will regenerate your health faster reducing the disadvantage you have in facing enemies in quick succession. In summary the CBJ-MS is the fastest firing Submachine Gun will the least range making it perfect for close range engagements. Extended Clip, the Silencer and the chosen perks will help you out at close range by keeping you hidden and increasing your mobility. 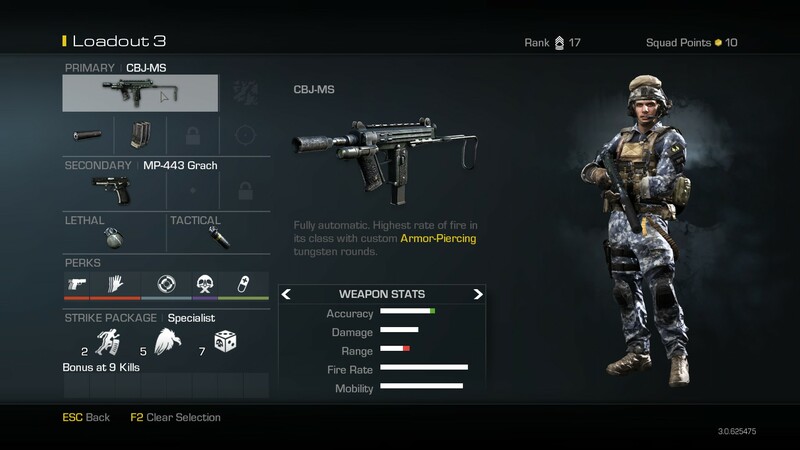 This entry was posted in CoD Ghosts Weapon Guide, Submachine Guns and tagged auluftwaffles, best Class Setup, Best Soldier Setup, Call of Duty, Call of Duty Ghosts, Call of Duty Ghosts Weapon Guide, CBJ-MS, CBJ-MS Best Class Setup, CBJ-MS Best Soldier Setup, CBJ-MS Guide, CBJ-MS Soldier Setup, CBJ-MS Weapon Guide, Class Setup, Games, gaming, Ghosts, Ghosts Weapon Guide, guide, PC, Ps3, PS4, Soldier Setup, video game guides, Video Games, XBOX 360, XBOX ONE. Bookmark the permalink.